Well into the second quarter, markets have recovered after a torrid opening to the year, however sentiment remains challenged by the lack of a strong investment case to rally firmly behind. With the arrival of June, a critical month for markets featuring the Brexit referendum and a Federal Reserve meeting, the FT asked market commentators how the rest of the year will pan out. What events or data will shape markets for the remainder of 2016? Brexit and Federal Reserve meetings figure prominently, while China lurks in the background. John Bilton at JPMorgan Asset Management is optimistic about global growth and thinks that will aid dollar consolidation, spurring risk appetite, but says UK investors will “find it difficult to focus on much beside Brexit risk”. Commentators also worry about China across a multitude of areas — from a growing non-performing debt problem and restructuring of State Owned Enterprises, to growth data and its capital account. 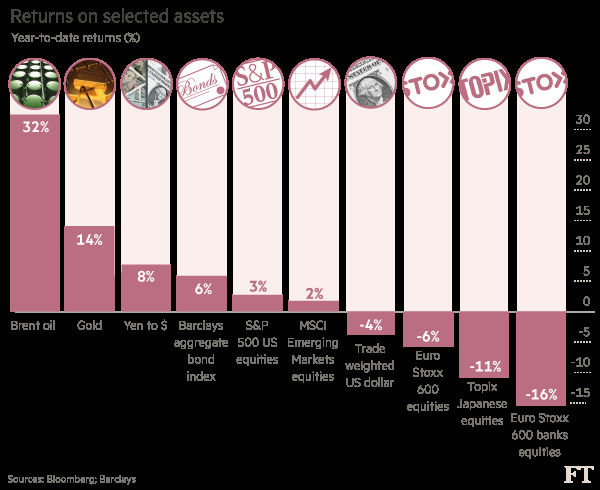 Which asset classes feel most and least attractive? Alain Bokobza, head of global asset allocation at Société Générale, favours inflation-protected bonds, while Mislav Matejka of JPMorgan prefers “hard assets” — such as gold and real estate — because policy will shift from monetary to fiscal stimulus. Equities may no longer be cheap, says Mr Bilton, but they are still an attractive alternative to bonds. Mr Bateman is convinced Brexit won’t happen, so plumps for UK equities on a relief rally. But for Mr Matejka “least attractive from here are equities, given the potential end of the cycle”. Which three assets would you back? Buy every G10 currency against the dollar, advises Ulrich Leuchtmann of Commerzbank. “I find it hard to believe that the trend we saw in the first months of 2016 is over,” he says. Gold gets a good following, oil is also reasonably favoured, and there is a smattering of support for EM assets. Real estate, credit and gold are Mr Matejka’s preferences, while Mr Monson opts for high-yielding global equities, global bank stocks and a selection of EM equities. “International investors will need to remain patient, but valuations versus developed markets are offering near decade low discounts,” he says. Which trade do you wish you had recommended this year? The swings in market sentiment this year mean there are many profitable surprises to choose from: Long yen, long EM, short US dollar, long oil. “This year has all been about the momentum reversal and the rally in anything related to emerging markets or the dollar,” says Richard Turnill, global chief investment strategist at BlackRock. Which trade recommendation do you wish you hadn’t made (and could it still come good)? European equities were favoured at the start of the year on hopes for divergent monetary policy, but early investors in the Euro Stoxx 600 are down more than 4 per cent in 2016. The European banks sector sits nearly 16 per cent lower this year and over a third off their 2015 high. However, Mr Monson stands behind his global banks subsector — capital-rich dividend-paying banks with limited EM, southern Europe and investment banking exposure — to generate growing dividends and price appreciation from today’s “very low valuations” and as a “hedge” against rising interest rates. Australian bonds have been helped by the Reserve Bank of Australia cutting interest rates, says Matthias Scheiber, multi-asset fund manager at Schroders, “but it remains a volatile trade driven by uncertainty about the Chinese recovery”. Mr Bilton also likes the Aussie bonds as “valuations on credit assets offer a more attractive entry point than equities”, and they are one of the few sovereign bonds with relatively high returns. It’s May 2017 and the Fed still hasn’t raised rates again — what are the chances, and what would be your investment strategy now? While most forecast a raise this year, Mr Hale says the do-nothing option is “a real possibility”. To believe this scenario, you are “counting on economic disaster”, says Mr Bateman and so recommends haven assets of gold, oil and inflation-linked bonds. Likewise, Mr Matejka would focus investment on free cash flow, buybacks and yield, adding that “real estate and utilities should be the winners in this scenario”. However, if there was no recession in the scenario, the dollar would weaken and “this would be extremely positive for commodities and most emerging markets”, says Mr Bokobza. Mr Turnill agrees an environment with the Fed on the sidelines and where global growth “is holding up but remains low” would be extremely bullish for emerging markets and commodities.